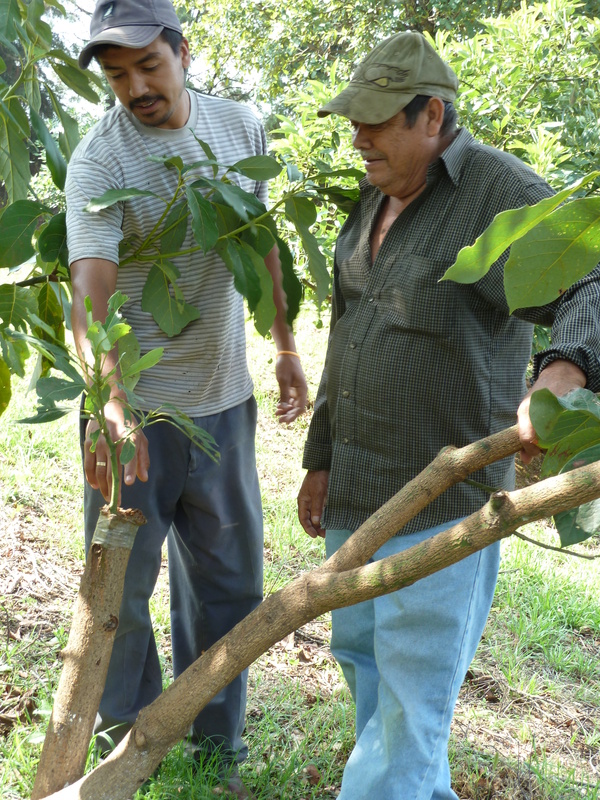 Through the Avocado Obstacle Course, Part I | Small Farmers. Big Change. team to an avocado huerto in Tingambato, Mexico. 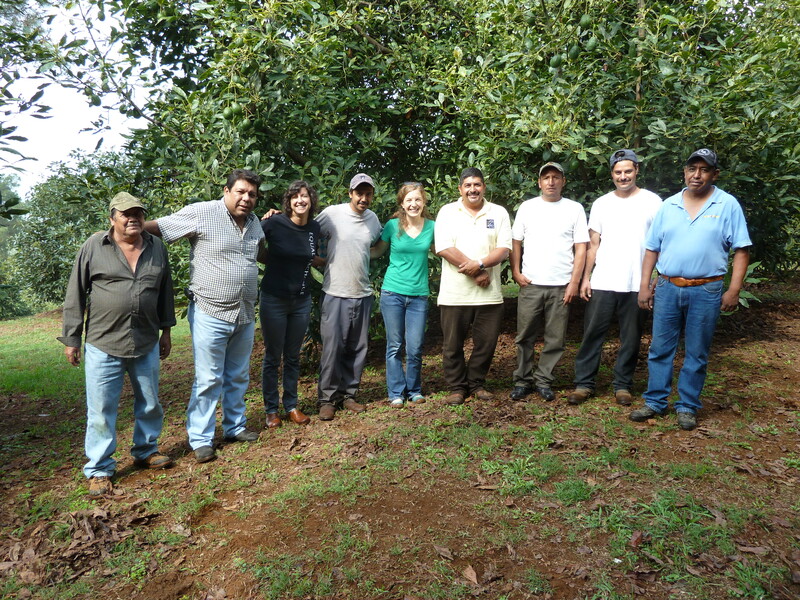 In the photo are: Jose Luis, Salvador (GM of PRAGOR), Nicole Vitello (EE), Jessica Jones-Hughes (EE), Rafael, Alfredo, Salvador, Ruben. Despite some concern, it was important to us to meet the people and places behind a product before engaging in a new trade relationship. Our worries immediately faded away when Salvador, the General Manager of Pragor, greeted us upon our arrival. There was an instant comfort with Salvador. It was an ease that only comes when encountering individuals fighting the same struggle as is Equal Exchange: changing the reality of business and trade for small producers. During the next three days, we received a crash course in the avocado industry and experienced a whirlwind of huertos (the avocado farms), packing houses, negotiations, and some delicious traditional Mexican meals. During our time in Mexico, we were constantly exposed to the numerous obstacles that Pragor faces on a daily basis. These producers are trying, at great risk and with incredible courage, to do something different. Over and over we asked, “how do you continue to do this hard work?” The answers were profound and full of the heart that is Pragor: “what else would we spend our time doing? What else is more important than not giving up but moving forward until you figure it out?” I was struck by the conviction of the Pragor producers and staff for upholding their integrity in an area where fear, corruption and multinationals are in control and often working in cahoots. The best way to understand the reality that Pragor faces is by comparing it to a giant obstacle course. However, instead of an obstacle course you only need to finish once, Pragor must overcome all obstacles on a weekly basis. You and your 50 fellow farmer co-op members enter a great mountainous obstacle course; each member holds a 25 lb box of avocados. To succeed and successfully sell your avocados on the other side, in the United States, you must overcome all four obstacles and cross the finish line with at least 20 farmer co-op members and avocados in hand. Challenge: You are in the middle of a great valley surrounded by hills. You and your fellow co-op members must get to your land mid-way up the mountain. There is a blockade of Mexican drug cartels somewhere on the mountain. You must figure out how to bypass the mafia and get to your farm. Despite this description, the area is aesthetically beautiful: full of rolling hills, pine trees and mountains. The backdrop is a lush green paradise due to the rains that fall each year, June to August. As we drove down the main road, we passed a series of villages. In some, we see indigenous peoples touting traditional brightly colored dresses, living in wooden houses on stilts. In others, the houses seem more modern and the residents walk around in jeans jamming on iPods. You get the idea from how bustling this area is that the majority of the drug industry is underground, in secluded areas. There is one unavoidable reminder that pulls you from the hypnotizing beauty: military trucks full of Mexican army troops carrying large weapons, heading to the tierra mas caliente. For farmers living in the more dangerous areas, the military presence is a positive sign, as it means the government is responding to the cries of the people. Each week Pragor must be tuned into the danger level of each area and avoid mafia road blocks to get avocados to market.